In the last years the activity of our group has been focused on the West Africa countries, just North of the Equator. Our latest activity from Ivory Coast saw us to cover the lands between Togo and Sierra Leone. Ivory Coasthas been recently involved in a civil war ended just in March and the potential risk had discouraged us to go and perform our activity in that Country. For several reasons we were late this year in planning our next dx expedition after the last one in Liberia in April 2010; in fact we started to look for some contacts just at the end of June. The consequences derived by the civil war affected the organization, as the major part of the available information was not updated and most of the telephone numbers we called either were not active or gave no reply. Jean Jacques was immediately enthusiastic about the idea to establish a dx expedition in Ivory Coast. The Country wanted to show the rest of the world that a reasonable stability had been reached after the dark period of the civil war. His support was fundamental and effective, thanks to him and his club it was possible to achieve the license in a relatively short time, including the vanity call TU2T, which could be released without any problem. Ivory Coastis not included in the top most-wanted list, nevertheless our previous experiences in Africa have shown us that the ranking list does not show the real situation, as we always logged qso continuously, from the starting day to the end of the expedition, with endless pile up. We expected something similar also in this occasion, even bearing in mind that there had been no serious activity in that Country in the latest 10 years. The low bands seemed to be the most wanted but we were conscious that the high solar activity would not help us on the lower frequency, on the contrary the higher frequency would have favoured us thanks to the high solar spots. The Ivory Coast Radio Ham community consists of some dozens of fellows, mostly active, before the war, on VHF thanks to a repeater set on the top of a high building in Abidjan. Sporadic, instead, is the activity on the HF, sometimes by some missionaries. The radio Ham activity has been reduced further, as the VHF repeater, as well as most of the equipment have been stolen or destroyed during the 18-month war. Nevertheless the A.R.A.I. is well active and organized and the president TU2OP Jean Jacques has been recently elected president of the Working group STARS (Support To Amateur Radio Service) for region 1 during the last IARU conference held in South Africa in August. In the first phase of our investigations we focused, as elected area for our activity, on the West coast, in the Sassandra or San Pedro region, 400 km far from Abidjan. We knew about some island in the area, valid for the IOTA program never activated. In spite of an intense investigation we could not get any useful information to understand if an activity, even temporary, would be possible. Furthermore, in spite of all the information available on the net, almost all the resorts in the area were no longer active, as during the war they were heavily damaged and looted. Only a few of them were actually operative, with reduced service. Finally, though all the persons we talked to assured us on the general situation, we were seriously concerned for our safety in such an area, so far from the main cities. Reluctantly we were forced to give up the idea to activate a IOTA new-wanted, then we focused our investigations on some area East of Abidjan, where the coast is a narrow strip between the Atlantic Ocean and a soft water lagoon. We found a resort in the area which seemed to own all the requirements we were looking for. The Northern side of the lagoon would have assured us the best performances of our antennas and the bungalows would have allowed us the best logistic set-up. A swimming pool would have granted us good comfort and relax, due to the high temperature and humidity which are peculiar in the area. Apparently, it seemed to be the perfect solution for us, we just needed to verify if all the information we collected on the net was true. What we experienced during the previous contacts with other resorts authorized us to be concerned for the consequences of the war even in this case. 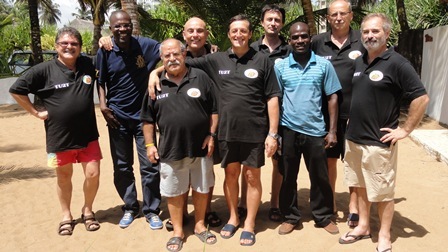 Once again Jean Jacques TU2OP came to help us and together with another OM Mathurin, TU5JZ, A.R.A.I secretary, went to the resort to verify that all what was on the net corresponded to our expectations. A final problem was pending: internet connection is really important to us and it was not operative in the resort. Without the net our expedition would be heavily penalized. In some previous dx expedition we experienced the real-time log-on line and we were not ready to renounce to it. Jean Jacques TU2OP gave us a precious help in this case also: he organized a survey by a local phone operator engineer to the resort to assure that the area was covered by the wi-fi network and after a positive response he procured an access point for us, which was delivered to the resort prior to our arrival, together with our official Ivorian Radio Ham license. Our team, by now well tested, and composed of Alfeo I1HJT, Angelo IK2CHR, Marcello IK2DIA, Silvano I2YSB, Stefano IK2HKT, Vinicio IK2CIO, was working hardly to be ready with all the details for the coming dx expedition. A new member Gino IK2RZP jointed in the group to replace Carlo IK1AOD, historical member, not available in this occasion. We can say that the imagination of the air companies is limitless and there is something new to discover at any trip. Despite all our experience in the previous trips and all the accurate job done by Silvano to trim the weight of the equipment boxes, once at the Royal Air Maroc check-in desk in Malpensa airport, the manager contested that the corners of some containers were too sharp and they could damage the aircraft body. It was worthless telling him that just one year ago we flew with the same containers, by the same air company and with the same airline manager (himself) without any problem or complaint. No other solution was found but to get immediately some cardboard to protect the corners and to fix it with a plastic wrapping. Abidjanairport is not that big, but it is surprisingly modern, clean and well equipped. No problem at the Customs check-point, the officials were not looking for problem and the packing list stamped by the Ivorian Ambassador in Italy was enough to them. M.me Catharine, the resort owner, was waiting for us and soon we loaded all our packing on her pickup truck and stuffed ourselves in a minivan. After 20 minute driving, crossing an inevitable check-point under the on-duty military sleepy eyes, we left the paved road for a bumpy track. We could not avoid to make some perplexed comments on what we could find at the end of the ride. Finally the resort La Maison de la Lagune appeared in front of us, it was almost 3,00 AM and we were very tired after the long trip. The light in the resort was weak and there was no public light in the nearby. A further surprise was waiting for us, as when unloading our stuff from the pickup we realized that two cases were missing. We could not realize how it could have happened, and by scrolling all what we did after landing, we were sure the luggage had been collected and loaded on a trolley in full. Not finding a logic explanation, there was no other solution than to resign ourselves to go back to the airport. Alfeo and Silvano convinced the driver to drive back and, when we reached the airport, there was not a sign of our luggage, neither in the parking, nor in the airport where some officials kindly accompanied us to inspect some storing places. There was no other solution but to come back during the regular working time and ask to check the survey camera recording. Ruefully, the more and more sleepy driver turned back his car and during the way back we received a call from Gino announcing that they had found the luggage: they had been unloaded by an attendant of the resort’s and stored in a dark corner, where they remained unnoticed. On the following morning, the rising sun found us already working to inspect the location and to decide where and how to install our stations. Five of the seven available bungalows were leased by us and the remaining two were luckily free, then there was nobody to complain for the noise and the shouts, which are specially loud during the antennas assembly. Our set-up included 4 complete stations, 2 of them located in independent bungalows, to operate CW and SSB and equipped with the well-tested Elekraft K3 and Acom amplifier, antenna Spiderbeam for HF bands 10 to 20 meters, including Warc and 2 bands vertical for 40 and 80 meters. The Spiderbeam for the CW station had 2 further elements for 30 meter and an inverted L for the topband. 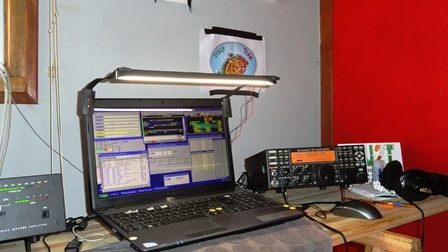 A third station was dedicated to RTTY traffic, used also as back-up for CW and SSB, again with K3 transceiver and Elekraft KPA 500 amplifier. As antenna a vertical Steppir, tuneable from 6 to 40 meters was available. The 4th station was equipped with a FT857D, mostly dedicated to the “magic band” and connected to a 3-element cubic antenna. Often this station was set as beacon to test the propagation on 6 meters band. Both the last 2 stations were located in the same room having the possibility to share antennas and amplifier to exploit the propagation conditions on 6 meters. The resort extent was not that large, having a trapezium shape with two major sides 100 meters, one overlooking the lagoon. There was a number of palm trees and many other floweringplants, nice to see but not worth for the placement of our antennas, which require to be as far as possible to allow us to operate on the same band in different modes. It was not easy to set the spiderbeam, which requires a rather large free surface for the assembling. We could, finally, find a site were to set them side by side. Easier was to set the Steppir on a wooden jetty just on the lagoon, with the radials immersed in the water. For the other verticals and the 6 meter cubical we found enough room between the palm trees. Working hard to keep the station ready to operate did not require a long time, after laying dozen of meters of cables and radials on the soil, keeping ready the wi-fi net as well as the link to internet, at 15,14 the first qso with our pilot station Arturo IK7JWY was put in the 10-meter band log, giving our freshman Gino the honour to be the first on the air from TU land. In a few seconds, when the first spot was broadcasted in the packet cluster, all hell breaks loose, the pile up starts to be huge, giving us the feeling it would be the same during our stay in Ivory Coast. Being the unique guests in the resort we could enjoy the benefit to manage our timing and rhythm. The breakfast and the dinner were served in the reception veranda in front of the lagoon while the lunch was served on the sea side terrace, close to the swimming pool. We never renounced to assemble together for the meal, we have learned long ago how important is the convivial meeting to exchange ideas, to define the operation shifts, to laughand joke, to dissolve the inevitable tensions. Despite the inconveniences and the interruption of any activity during the war period, the resort has preserved a good reputation and the restaurant, with its various and tasteful menu, was haunted, especially during the weekend, by numerous guests mainly white-skinned, who M.me Catherina said us to be U.N. officials. Among them we met a Brazilian OM who, once he understood about our activity, promises to help us in a possible future expedition somewhere in South America. When the remaining two free bungalows were rented to some guests during the weekend, we were asked to moderate our shouting and noise, almost during the night time, not to bother the other guests. The resort’s owner, M.me Catherine, is a petite, still very active French lady who realized a real island of fashion and bon-ton, unexpected at all in such a corner of Africa. The resort is clean and well maintained, the rooms, one per each bungalow, are furnished with inspiration to different themes, the lobby is a little art gallery with typical painting and sculptures. Our long stay at the Maison de la Lagune embarrassed sometime M.me Catherine and the chef, always committed to proposing us different menu at every dinner or lunch. We have to admit that the meals were excellent, the meat was very tasty, as well as the fish, which often was delivered to the restaurant directly by the fishermen coming from the village close to the resort. One day they arrived with a 1-meter long Barracuda which, once properly cooked and served as skewers, proved to be a pleasantdiscovery. It was a pity for Stefano, who does not like the seafood, he will never know what he lost! From the swimming pool close to the beach, we could attend the almost daily fishing ritual. Long nets were dropped in the evening, parallel to the coast, by a couple of long and narrow pirogues pushedrowing. The following morning the nets were hoisted to the beach by all the inhabitants of the village, men, women, children, by means of big ropes, following the cadence marked by the village chief. The bags were often full of a variety of small-sized fish, including big jellyfish which were rejected to the sea. 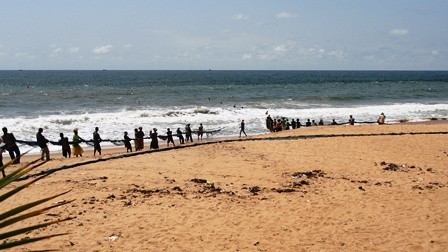 The sea is always rough along the West Africa coast, with waves no less than 1 meter tall, which violence discouraged to venture in the water. The swimming pull was an excellent alternative and it was pleasant to plunge to get refreshed from the heat and the high humidity or to recharge before facing our pile up turn. It is usual in all the dx expeditions, once the equipment installation is done and the activity has started, to begin refining the set up, to try fixing the minor problems that, inevitably occur. Just on the rear of the resort the main electric power line was running and very soon we realized that it was the source of some annoying noise picked up by the Spiderbeam SSB station antenna. We took the decision to move the antenna far from the power line, just on the lagoon side. The antenna was lowered and moved, without dismantling it, to the new location by dribbling the numerous palm trees. We were looking as the Patron Saint procession carrying the antenna in triumph. To complete the picture, during the operation a military helicopter appeared to spin over us, with the crew taking photos. We will never know if they enjoyed the show, the important is that their attention just ended after this passage. We could listen often bursts ofweapons coming from the opposite lagoon side, we had been told they were some exercises in a military base, we were concerned thinking of some raider who could pay us an unexpected visit. A dx expedition is also the occasion to putunder heavystress the equipment. Should some latent defect occurs, it will appear sooner or later and the theory was confirmed in this occasion also. The first to fail was the Steppir antenna: first came a damage on the flexiblestrip rewind device, then an integrated circuit burned on the controller, then the antenna was definitively out of order. We could replace the Steppir with wood and fibreglass poles hanging some electric wires to build a multiband vertical antenna. The linear amplifier Elekraft KPA 500 showed, instead, its vicesofyouth, a capacitor on the 18 MHz filter unit burned out. Luckily a similar one was in our spare part pack and soon the damage was fixed, thanks to the timely on-line advice by IK4ISQ Carlo Bianconi, responsible for the Elkraft service in Europe. Such amplifier appeared recently on the market and our expedition has been one of the heavy duty test for it. Apart from this defect, the amplifier worked perfectly even after hours and hours of heavy pile up, we logged 8.000 qso on RTTY and 4.000 on CW and SSB thanks using it. 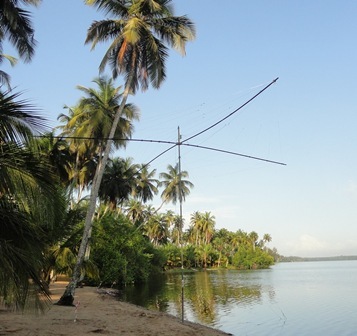 We already experienced in some previous expedition the good performances of the antennas when installed on the water, and once again we got the same feedback from the verticals placed on top of wooden jetty, right on the water. Due to the high solar spots we could operate the high bands for the whole daylight hours and often during the night time, it was not so unusual to realize we were working at the same time in 10 meters with three stations on different modes. On 6 meters the propagation was not as we expected, we often got a patchy propagation with low signals and sudden interruptions; even using high power it was not enough to rise the pile up. We lavishedmuch efforts on the magic band, we have 1.015 qso logged, including 35 countries including LU,ZP,KP4,SM. The propagation on the low bands have been problematic. We immediately laid a Beverage and we erected a DHDL but they immediately showed to be inefficient, perhaps due to sandy soil property, soaked inwater. We already faced some problems tuning the verticals for 40 and 80 meters due to the soil effect. We needed to significantlyprolong them, 1 meter the one for 40 meters, more than 2 meters for the 80 meters to bring theminto resonance. Despite our expectation, the low bands were rather silent, with just a few noises therefore the receiving antennas gave no benefit and we got no improvement on the signal – noise ratio, it was more useful sometimes to listen by the same vertical antenna used to transmit. We decided to remove the receiving antennas and to set a “diamond loop” and a low dipole to face an unexpected increase of the noise, luckily ended after 2 – 3 days. We got some improvement by using the diamond loop but the real problem was that the received signal was really weak to our receivers. We did many efforts to improve our performances, up to hanging on a palm tree prominenton the water a vertical for 160 meters forcing Vinicio to plunge in the hot lagoon water to lay the 40 meters long radials. We achieved some improvements on our transmitted signal but no benefit on the received ones. We did our best, every night we were on the air on the low bands but just in a few occasions we got favourable conditions. Almost every day, often during the night, the skies unleasheddownpours and storms but the noise by the static was not so annoying and it did not worsen the noise too much, apart from the last night of our stay, when we were forced to switch off all our rigs. Some days after our arrival e Jean Jacques TU2OP and Mathurin TU5JZ came to pay us a visit: it was finally the occasion to meet each other after an intense exchange of e-mails and telephone calls, their contribution has been essential tothe success of our expedition. 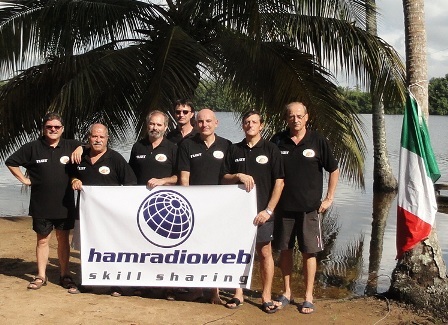 They promised us to collect information about the IOTA islands, they would be very proud to succeed in giving prestige to the Ivorian Radio Ham activity, we hope their wish will become true in the next future. In all or previous experiences in Africa we were afflicted by big problems in the electric energy supply, due to the frequent power failure. It was not the case in Ivory Coast; the energy supply was stable, we got just a failure on the day of our arrival. We were afraid it was the prelude for the next days problems, but luckily it did not happen in the following week. A 15KW gen-set was available and we started it when we got a failure after the first week. We realized immediately that its voltage was too low and the engine was producing some worrying noise. We decided not to take the risk to damage our equipment and it was the occasion to wait for the electric power by taking some relax in the swimming pool or taking photos. Just during the last day we faced a serious problem with the power supply: night time a strong storm forced us to switch off all the rigs and the following day we got many power failures. The storm had produced some damages to the internal Ivorian network, as we were not connected. It was our intention to operate till the last minute on the last day, but due the inconsistency of the power supply and the lack of internet we decided to dismantle and to pack all or stuff a few hours in advance. Once more we could keep the real-time log-on-line thanks to the software developed by Giacomo IH9GPI. We got a number of positive feedback on our guestbook and many posts on various forum. It did not avoid us to log 3072 dupes, which proves that many OM do not consult the log-on-line. In addition to that, in coincidence with our expedition, T2T was on the air. It was no so rare to read in the packet cluster pots showing T2T call on our frequency, wewere beinginundated withcalls immediately, it is the sign that a lot of hams just read the packet cluster without taking care to verify who is on the air. Taking advantage of the reasonably fast internet connection, we tried to amaze the worldwith special effects, acting some video streaming transmissions, showing real-time some of our stations during the operation and giving the possibility to chat on line. Many OM declared their appreciation for this test, we got dozen of users on line on “hamradioweb” the web page by our pilot station, and many positive feedback in or guest book. 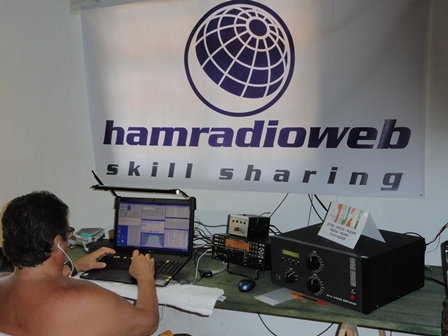 Two weeks is not a long time to run, shortly camethe day to close our activity, we were close to 80.000 qso. Hadn’t we been forced to close in advance or activity the last night and day, perhaps we could have reached this target, though a high qso number was never our goal. Again, after we loaded our stuff on Cathrine’s pick-up, we headed to the airport. No problem there, except for some deeper scan investigation on our luggage when the manager were informed that we were carrying some radio equipment. Luckily the official did not ask us to open the boxes as Silvano forgot the keys to thepadlocks inside one of the cases. This expedition is past history now, but all the times new feelings and fresh emotions well up in us, and the recollection of them immediately rises the level ofadrenaline. We will never know how many hours of sleep we missed during the expedition, it must have been many of them, if we think of how deep we slept during the flight back and of our physical weakness when we reached home, but this is alsopart of the game.